A reader sends in this photo he discovered while doing a bit of Facebook stalking. While he did not provide many details of the events that lead to this picture's existence, we can make a few inferences. •The two lovebirds appear to have gotten married on a golf course. •They either were married while wearing Miami Dolphins jerseys or each had their Miami Dolphins jerseys on hand in case of emergency. •According to old-timey tradition the bride is presumably sexually pure. Or a liar. •If you noticed the bride's left hand, you will be getting punched soon. 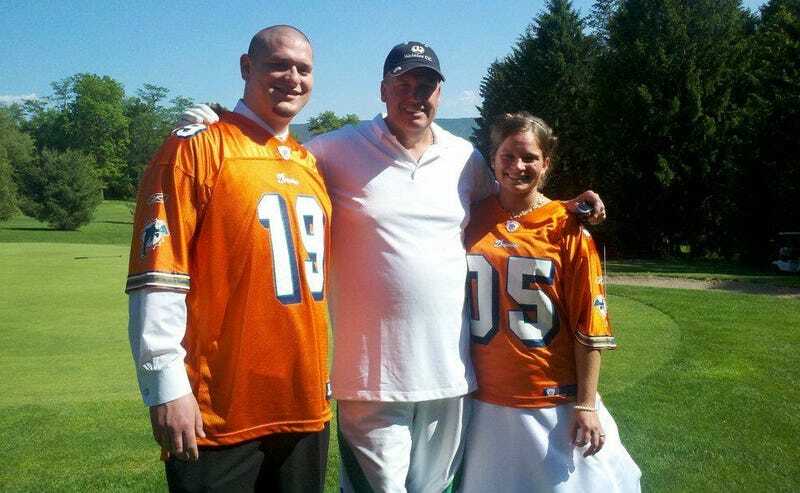 •The groom appears to be taking the Brandon Marshall trade well. •It was a lovely day for a wedding, but rain on your wedding day is supposedly good luck (but not ironic), so these two are probably screwed.